Mid-August and the Minnesota State Fair equals “back to school,” even as an adult. Summer’s gift is one of relaxation, restoration and rejuvenation, if you do it right. As Fall approaches, use that fuel to get re-engaged in new endeavors. In the spirit of engagement, I signed up for the Women Rock Half Marathon on September 1st. Simply setting that goal has focused my training. Set new goals and stay enthused so “back to school” brings motivation to move you forward to the life you desire and deserve. And remember to carry your calm and cool summer self into Fall. Great advice, although, in my case, I shall be carrying my cold and calm self into a warmer spring. Congrats on your goal!! Cute pooch pic! 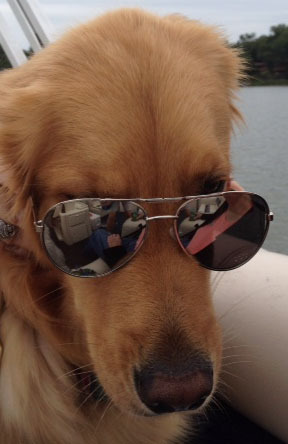 Love the shades puppy!!!! Love all of your Golden Retriever pics and the inspiring quotes. Look forward to seeing more!